Juli is a 1996 graduate from Alma College with a Bachelor of Science in Exercise and Health Science, and a minor in Chemistry. Her further education is from Wayne State and Oakland Universities, which focused on Anatomical Pathology. Juli finished with a Veterinary Technician degree from Wayne County Community College. 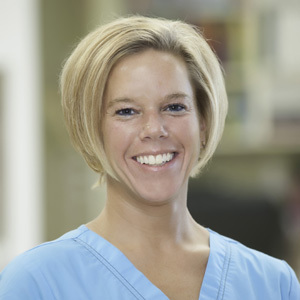 Juli has experience in general veterinary medicine and did some specialty medicine at a feline only practice before joining AEC when we first opened in 2002. "I am a very friendly and enthusiastic person who loves animals. I love the busy and unpredictable atmosphere of emergency medicine." Juli's interests include family and friends, biking, fishing, rollerblading, running, playing soccer and working out. She has two daughters, Hanna and Hailey; two cats, Maici and Taz; and two beta fish.